← CALL ‘EM OUT GOES BACK TO WAR! DIRECT ACTION TO STOP WATER SHUT-OFFS! Rev. 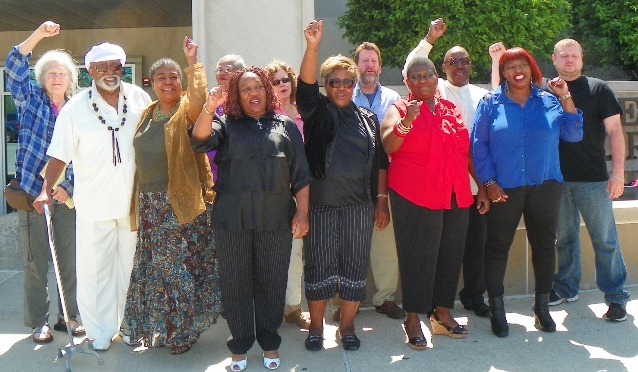 Pinkney’s supporters outside Berrien County Courthouse May 31, 2014. His wife Dorothy Pinkney is fourth from left. 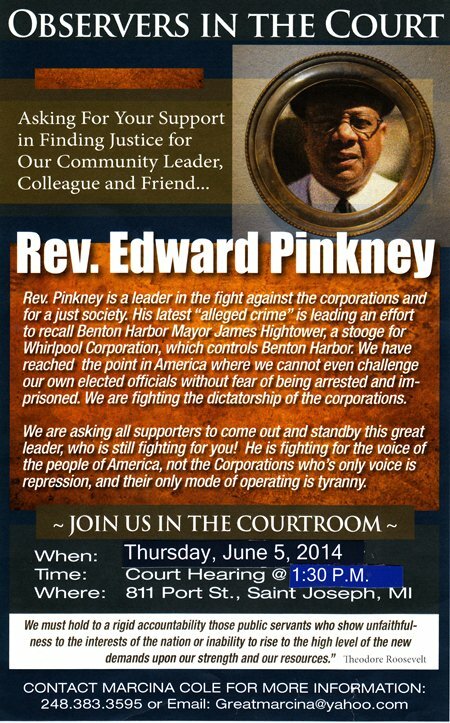 BENTON HARBOR –Supporters of Rev. Edward Pinkney packed the courtroom for his day-long pre-trial exam on five felony charges of election law forgery May 31. The charges, each carrying a maximum penalty of five years in prison, relate to a recall campaign against current Benton Harbor Mayor James Hightower. Hightower is an ally of Whirlpool, a $19 billion global corporation which Pinkney and the Black Autonomy Network of Community Organizations (BANCO), have targeted for years, saying it destroyed the city’s job base by closing its plants, grabbed its land, and now pays no city taxes. The recall petition cited Hightower’s failure to approve a city income tax which would have forced Whirlpool to pay taxes to Benton Harbor. The recall election, which was to have been held May 6 after Berrien County Clerk Sharon Tyler certified 402 petition signatures, was indefinitely postponed by Fifth District Judge John Dewane, citing the charges against Pinkney. In key testimony, Sgt. James Goff of the Michigan State Police Forensics Lab in Lansing said he found evidence that dates on several petitions for the recall had been altered, using various methods. He referenced several petitions admitted into evidence. They had been enlarged, with the second side missing, then photographed with blocks indicating his findings covering parts of the petitions. Goff said he used infrared luminescence examination to identify different ink formulations, and “impression” techniques to find dates on the petitions had been altered. Impression techniques involve looking at the petitions directly beneath the ones in question to find impressions of the original written dates. How Goff accomplished that is unclear, since he had only 10 of 62 petitions submitted according Berrien County Sheriff’s records, which do not indicate the 10 petitions were in sequential order. Goff said he has been a “Forensics Document Examiner” for four years, but is not certified as such by any organization, national or otherwise, although organizations such as the American Board of Forensic Document Examiners exist to do so. He works for the MSP’s “Questioned Documents” unit in Lansing, where he is its only employee. He said he trained for three years under other Forensics Document Examiners, but did not say if they were certified. Parish objected to qualifying him as an expert but was overruled. Goff identified a photographic image of one petition, shown on a screen, which he claimed had 12 dates changed, from Nov. 8 to Nov. 18 and Nov. 28. 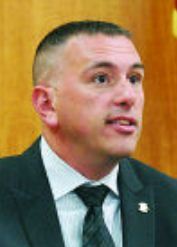 The date, Berrien County Prosecutor Michael Sepic said, was crucial because under state election law, only petitions with signatures dated on Nov. 9 or afterward, 60 days prior to their submission, could be counted. None of the petitions admitted into evidence over Parish’s objections were the originals. Instead Sepic used Xeroxed and photographic images. Berrien County Elections Commissioner Carolyn Toliver said she thought the Sheriff’s Department had the originals, while Sepic said Goff had them (although he only received 10 of 62 petitions.) Sgt. Zizkovsky testified he took possession of the originals from Toliver, but they never surfaced at the exam. 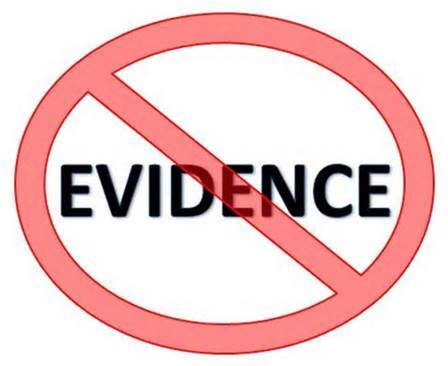 Schrock, however, said, “Under evidence rules, copies are as admissible as the originals.” Schrock denied virtually every objection made by Parish during the exam. 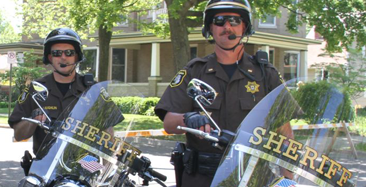 Berrien County Sheriff Sgt. David Zizkovsky, who said he had served with the military in Iraq, said in his report that he turned 10 original petitions over to the lab, out of 62 submitted. But only five COPIES of the ten, the ones circulated by Pinkney, were admitted at the exam. Summarizing Goff’s findings in his report, Zizkovsky said Goff noted evidence of date changes on the five other petitions, not circulated by Pinkney, as well. In the same report, he also said he himself asked the lab to change the dates on five petitions from 1/13/14 to 1/3/14. Parish pounded away at both Goff and Zizkovsky about the length of time that expired from Jan. 8 until the petitions were turned in to the crime lab. Goff said he got them on Feb. 26, allowing plenty of time for others with access to the petitions to alter them. 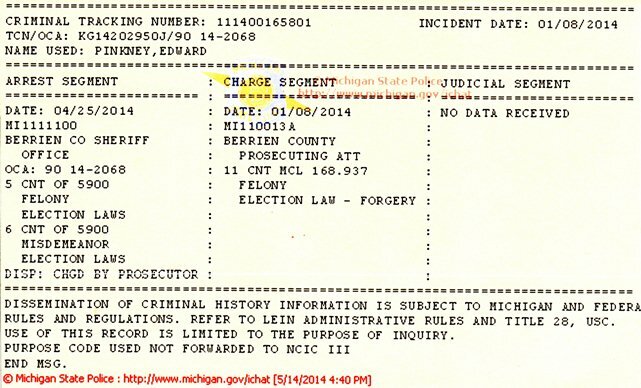 According to the Michigan State Police ICHAT website, which records state criminal cases, charges against Pinkney were brought Jan. 8, 2014, the day the petitions were submitted, prior to their submission to the crime lab Feb. 26, and prior to mass interrogations in Benton Harbor homes by Berrien County Sheriffs. 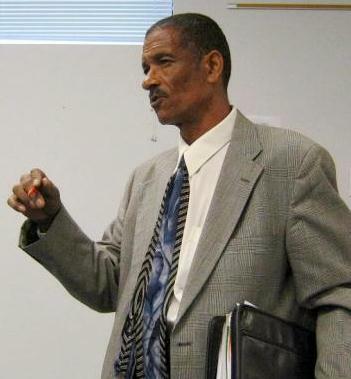 Zizkovsky admitted the Sheriff’s Department had begun investigating Pinkney prior to obtaining the petitions. The charges, which include five misdemeanor counts of “Election Law/ False Cert Circulatory” not considered that day, followed lengthy, detailed and often multiple interrogations by the Berrien County Sheriff’s Department of petition signers and circulators in their homes, on a scale not seen since the “red scare” days of U.S. Sen. Joseph McCarthy in the 1940’s and ‘50’s, according to Sheriff’s Department records. Of 62 petitions with 728 signatures, 54 petitions, including 34 circulated by Pinkney, were NOT examined by the lab. Zizkovsky said in his report that sheriff’s deputies, not trained in forensic document examination, selected the 10 petitions based on their own observations of what they determined to be irregular. Toliver testified first, then remained in the courtroom for the rest of the day-long hearing. Toliver said the petitions in evidence were actually copies of copies kept in the Clerk’s office safe. She said Rev. Pinkney attempted to turn the 62 petitions in on Jan. 8, but that she would not accept them because James Cornelius, not Pinkney, was the sponsor of the campaign. Cornelius, who faces one misdemeanor count in the case, then turned them in himself. According to the Sheriff’s Report, however, Toliver told Pinkney she would not accept them was because he did not live in Benton Harbor, but Benton Harbor Township. Berrien County Clerk Sharon Tyler first certified petitions, then withdrew certification. Toliver said she combed through all the petitions before turning them over to County Clerk Sharon Tyler for the Elections Commission to “begin the verification process.” She said she herself eliminated certain signature lines with names, addresses and dates prior to turning them in, because she felt they were questionable, then took a red pen and crossed out all the blank signature lines. “I scrutinize the individual’s handwriting, and check the dates for similar handwriting, and then I disqualify that line [if they don’t compare],” Toliver, who has no forensic training, said. Despite her efforts, the Elections Commission certified 402 signatures, verifying the signers were registered voters, enough for the 393 needed, and Tyler scheduled the recall election. Toliver testified that she phoned Mayor Hightower about the submission of the petitions at 9:30 a.m. that day, and kept in contact with him throughout the examination process to update him. She said she blacked out Hightower’s cell phone and address on her work sheet, originally submitted as an exhibit but then withdrawn by Sepic. Al Pscholka and Michigan Gov. 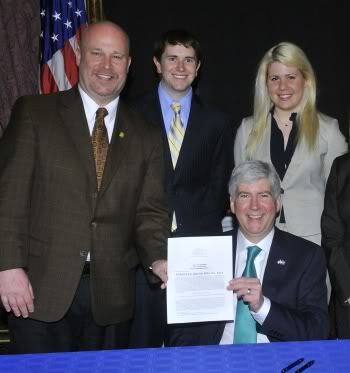 Rick Snyder after signing of Public Act 4, the first “emergency manager” law. Knowles told VOD that he himself had been subjected to a recall campaign in Benton Harbor that failed. He said he never received any calls from Toliver about the campaign in his case, only a written notice that it had begun. Toliver previously worked for State Rep. Al Pscholka, who started out as a staffer for Benton Harbor Congressman Fred Upton, one of the heirs to the Whirlpool fortune. Pscholka introduced the first “Emergency Manager” law, Public Act 4, into the state legislature in 2011. It was repealed by a majority of state voters in 2012, but immediately replaced by Public Act 436, which legislators made referendum-proof by the inclusion of a financial allotment in the bill. 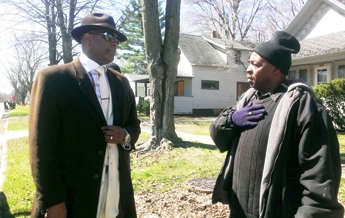 Benton Harbor was the first city taken over under Public Act 4, a move vigorously opposed by Pinkney, BANCO and numerous other groups across the state. 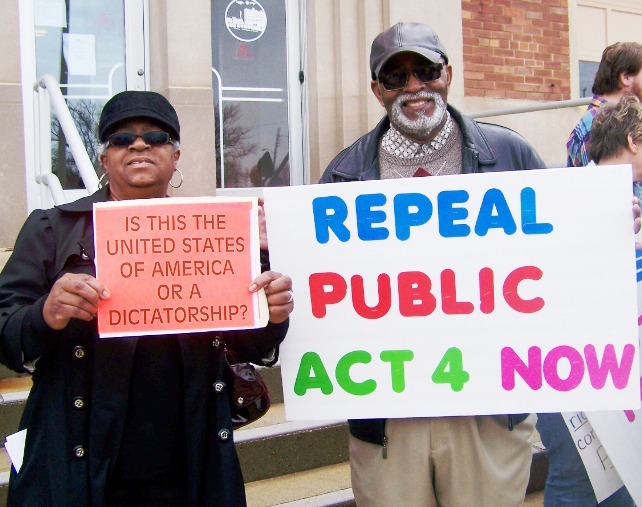 Detroiter Wanda Hill and Benton Harbor resident George Moon at first rally against PA 4 in 2011, on Benton Harbor city hall steps. PA 4 was indeed repealed, only to be replaced by PA 436. Sepic called several of the other petition circulators to the stand, many of whom expressed solidarity with Pinkney outside the courtroom and have been active previously in campaigns against the emergency manager law. “I don’t believe in [Mayor Hightower’s] philosophy,” George Moon told Sepic when asked why he joined the petition campaign. He said he gave his petitions as well as those of two other circulators to Pinkney. 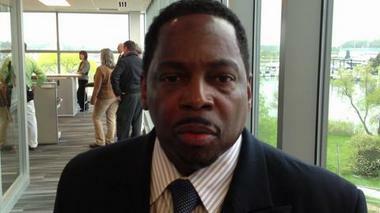 Benton Harbor Mayor James Hightower at reception in Whirlpool HQ. Asked if he changed dates on any of the petitions, Moon said, “No, that’s illegal.” On cross exam by Parish, Moon identified dates on the petitions that had been changed by the signers themselves to correct their own errors. 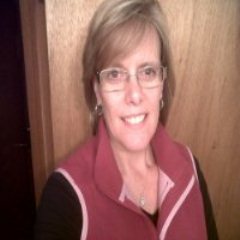 She said she gave her petitions to Pinkney, and also identified dates changed by the signers, including one changed from 2/2/14 t0 1/2/14 due to a mistake. 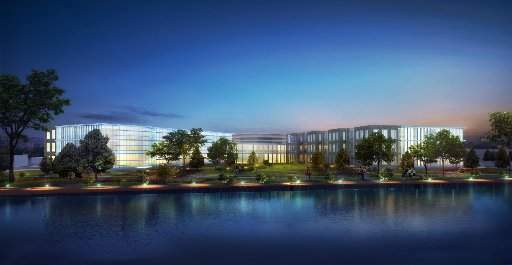 $85 million Whirlpool headquarters in Benton Harbor on prime riverfront property. Bridget Gilmore said she got her petitions from George Moon and returned them to him without changing any dates. She said Moon showed her errors on dates she placed at the bottom by her signature, and she corrected them, placing her initials by each correction. She said some signers changed their own dates after realizing they also had made mistakes. 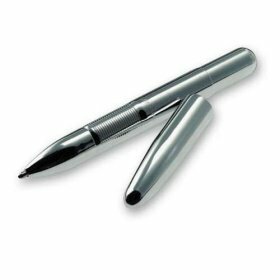 Witness says pen froze up. Elza Williams said she heard from a friend about the recall campaign and went to Rev. Pinkney to get petitions, then returned them to him at his house. She said she made a mistake on one petition that she signed at the bottom with the date 1/13/14, over which she placed the date 1/3/14. She obviously could not have signed the petition on 1/13/14 since Cornelius turned all the petitions in 1/8/14. During closing arguments, Sepic said the copies of petitions admitted into evidence were “altered, forged,” according to Goff’s testimony, prompting the recall election. Judge Schrock said he was reviewing the definition of probable cause as indicated by the Michigan Supreme Court in a 2003 case, People v. Yost, and would rule on Thurs. June 5 whether Pinkney should be bound over. Donna Yost appeared before Bay County Circuit Judge William J. Caprathe in a bond hearing, asking that she be released from prison while she awaits her new trial now that her conviction for the murder of her daughter, Monique, has been overturned. Yost begs to be released so she can attend the wedding of one of her daughters. 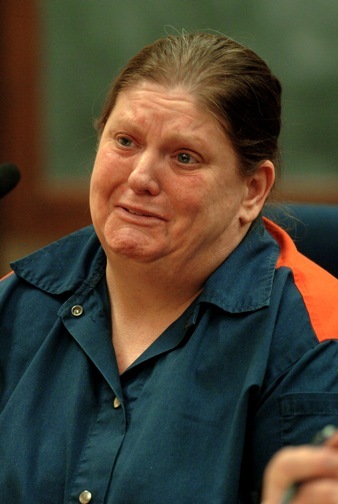 In People v. Yost, the MSC held that a magistrate had erred in refusing to bind over Donna Alice Yost for the murder of her seven-year-old daughter, who died from an overdose of Imapramine, a drug which was prescribed for her. Yost contended that her daughter had committed suicide. “There were proofs in this case that would cause a cautious individual to have probable cause to believe that the prosecution had circumstantially established that defendant had committed murder,” the MSC said in part of its ruling. Yost’s subsequent conviction was later overturned by the Court of Appeals. However, the Michigan Supreme Court later refused to hear the case and kept Yost in prison. Whether the MSC decision constitutes an unchallenged definition of “probable cause” is certainly at issue. Schrock’s citation of this case does not bode well. Whether “probable cause” should be found in Rev. Edward Pinkney’s case, not involving a murder charge but instead the legitimate use of Michigan’s election laws, is another question. Was there “probable cause” for the Sheriff’s Department to attack Rev. Pinkney’s home with a massive SWAT team April 25 in their efforts to arrest him? Was there “probable cause” for dozens of Benton Harbor citizens to be subjected to mass interrogation techniques for months through April, reminiscent of Hitler’s Gestapo? Was there “probable cause” to place Rev. Pinkney under house arrest after he had already posted bond, then forbid him from using his computer to communicate with the outside world? Is there “probable cause” instead to indict Michigan Gov. Rick Snyder and proponents of PA 4 and 436 for violations of the state and U.S. Constitutions through the imposition of emergency “dictators” on Michigan’s predominantly African-American municipalities and school districts? Is there “probable cause” to indict Whirlpool for stealing the livelihoods of Benton Harbor citizens, and then their land, while refusing to pay any taxes whatsoever to the city that made them the world’s largest appliance corporation? That is up to the people of Michigan and the U.S. to decide, and they must decide soon, for Benton Harbor and Detroit in bankruptcy under EM’s are coming to THEIR cities next.